The young female journalist sat comfortably on a brown leather club chair. Across the room, directly in from her was a tufted Victorian sofa, occupied by a gaunt, gray-haired, 85-year-old man. The thin gentleman, wearing a dark suit, seemed as quick-minded and robust as someone half his age. 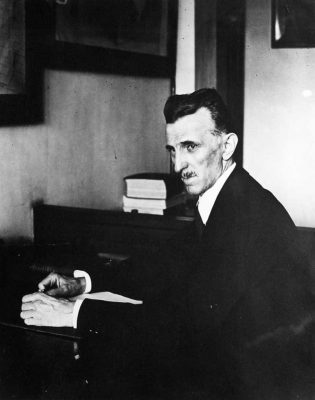 Nikola Tesla’s apparent vigor appeared to prove his theory that a man's efficiency and accomplishments should increase, and not diminish with mature age. The inventor who helped bring electricity to the world lived alone in room 3328, on the 33rd floor of The New Yorker Hotel. The room was sparse with only a small writing table, a bed, and a few other pieces of furniture to adorn its interior. There were four or five rock doves perched on the outside ledge of the room’s window, which added strength to the rumors that the old man loved pigeons. It seemed like an austere and lonely way to live, the insightful writer thought. “They’re right, I am,” the aging scientist said, smiling without a hint of self-reproach or timidity. “There will always be those who do not understand, just as people ridiculed Copernicus' theory of the planetary system, the unenlightened jeered my accomplishment, years ago, regarding cosmic rays. Pioneers who brave the future are always condemned by the masses. The young woman continued her interview, asking a variety of questions before finally asking if there were any new theories or inventions he would like to discuss, such as the defensive weapon he proposed to the military back in the 1930s. “I believe you called it teleforce, a weapon capable of destroying airplanes and armies at a distance of 200 miles?” the writer said. The journalist’s eyes widened, and her face went blank, surprised somewhat by this new revelation, “Are you talking about communicating with the dead?” she asked. “Well yes, if you’re talking just about night-time dreams and visions we have in our sleep,” she replied, wondering where Tesla was going with all this talk. Tesla continued to explain what he meant. “I grant you, your dreams are all in your mind, but they do in fact exist, and therefore, they're part of your reality. I suppose what I'm trying to say, is that you actually live in two separate realities; one world where you're awake and the other world where you're asleep. But there's also another reality. A place, which I refer to as an alternate reality, and as I said before, in my reality anything is possible. “I’m not sure what you mean by an alternate reality, are you referring to our dreams?” The writer asked, silently thinking that the interview was taking on a strange tone. Nikola smiled benignly and began his story. “The alternate reality to which I refer is something that I spent months developing in my secret laboratory at Wardenclyffe. The laboratory itself was constructed underground and could only be accessed through a tunnel that only a handful of my employees knew about. The whole project was kept a secret so that outsiders wouldn't know where or what I was working on. To this day, people are still looking for the mysterious tunnels under Wardenclyffe, a property I once owned, in the village of Shoreham, located along the coast of Long Island. It was a long time ago when things weren't going so well for me. I had lost my financial backing for the wireless transmission tower that I was building at Wardenclyffe, and I had no other source of revenue to keep it going. Had I been able to complete the tower, which conducted electrical vibrations from the earth, I would have been able to send wireless communications across the globe. It was my intention to convert our world into one global brain, capable of transmitting free radio waves across the Atlantic Ocean to future stations all across Europe. But my financial backer, J.P. Morgan, a wealthy financier, and banker didn't believe in free electric power for anyone, and so he stopped funding my project. ‘Without the money to continue, I had no choice but to give up my dream of providing a worldwide network of communications. So, in the days that followed, I confined myself to working on a smaller project in the secrecy of my underground laboratory. During that time, I recorded my progress in various journals, which I kept hidden in my laboratory. I conducted many tests, using a special chamber, which enabled the transmission of electrical impulses to my brain, thereby altering my perception of reality. ‘But time was not on my side, and without any financial support, I was doomed to fail, causing me to become increasingly despondent. And in my desperation to complete the project, I began submitting myself to longer episodes of electrical stimulation and logging the results in one of three journals, I kept at the time. ‘During that period, I was able to use the chamber to record my brainwaves with a recording device that I had invented. The device itself was capable of capturing and transmitting my visual thoughts to another person, thereby transferring my own alternate reality to the mind of another human, although, I should add that I had never tested my theory on anyone else. Unfortunately, before I could perfect this new device, I ran out of money, which forced me to sell my Wardenclyffe property to pay off creditors. And so on my last night at Wardenclyffe, all I could do was lock the door to my secret laboratory and carefully conceal the entrance to the tunnel. As I stood outside of my property and watched my dreams vanished into the night, I too, disappeared from Wardenclyffe, never to return again.